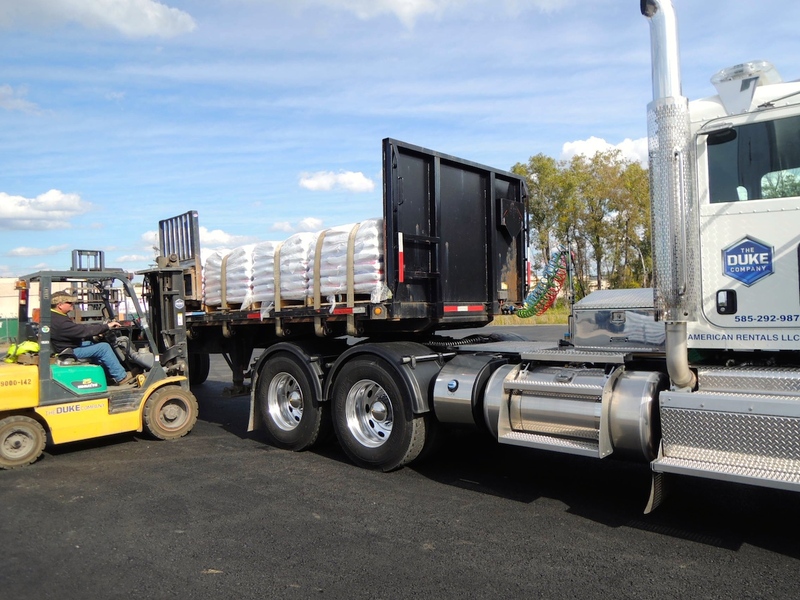 Rock Salt & Ice Control HQ (a Duke Company) has a variety of products for your deicing needs. 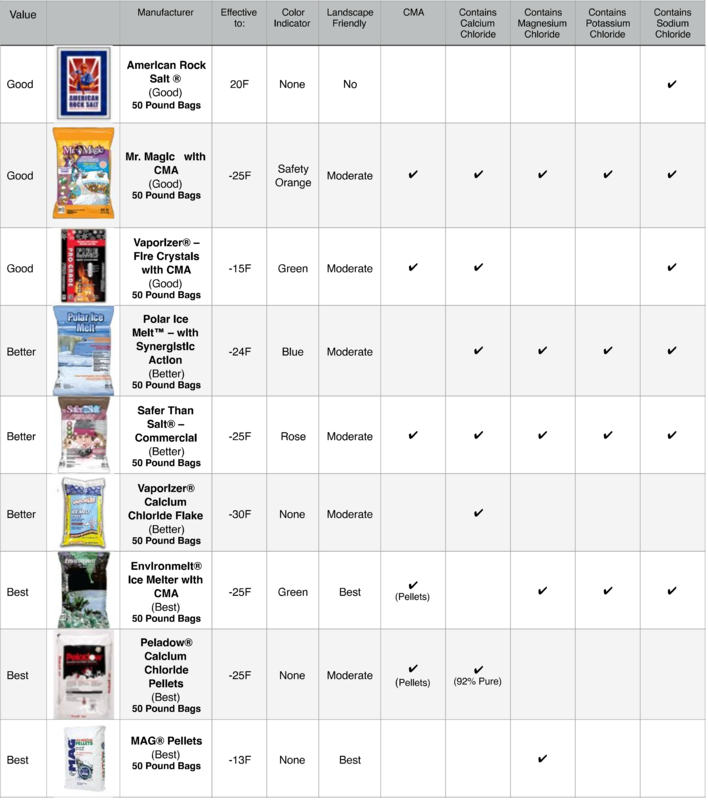 Our team is more than happy to advise you on what products would best suit your needs. Looking for an environmentally safer deicer? Or perhaps, a deicer that works well at low temperatures? 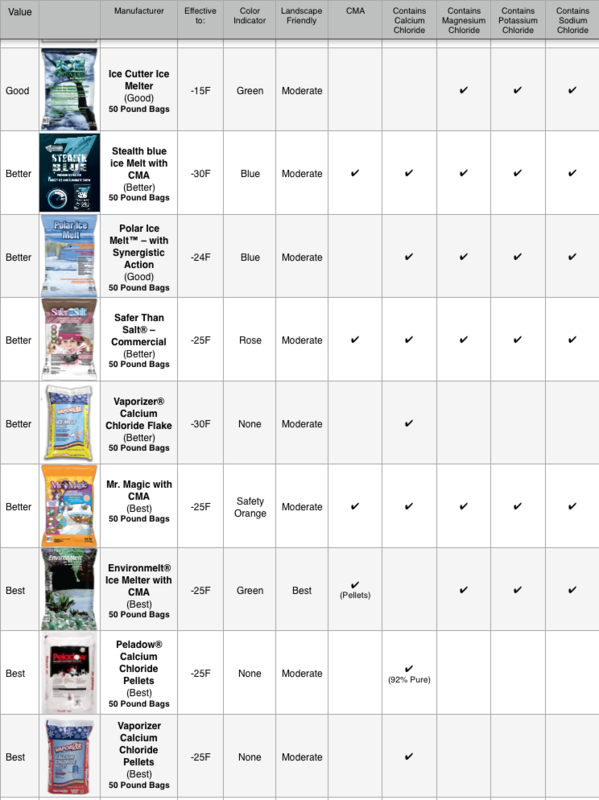 Below is a chart of the deicing products and their respective qualities. 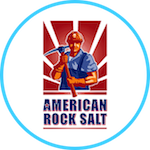 American Rock Salt (Good): an American made product, mined in Upstate New York, this exceptional rock salt is available in 50 pound bags. American Rock Salt is effect in melting to 15 degrees Fahrenheit and consists of 100% sodium Chloride. 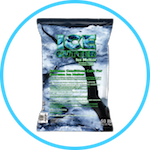 Ice Cutter Ice Melter (Good): When pre-applied prevents snow and ice from bonding to the surface area. As Ice Cutter goes to work, its time released formula stays on the surface area longer, helping to control the freeze / thaw cycles. Contains Magnesium Chloride, Potassium Chloride and Sodium Chloride. Vaporizer Fire Crystals with CMA (Good): available in 50 pound bags, this outstanding and cost-effective ice melt is effective to -15 degrees Fahrenheit. Manufactured with an advanced green color indicator, this powerful deicer contains CMA, Calcium Chloride and Sodium Chloride. 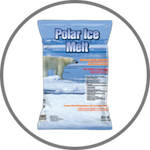 Polar Ice Melt with Synergistic Action (Better): available in 50 pound bags, this better ice melt is capable of melting to -24 degrees Fahrenheit. Polar Ice Melt is equipped with a helpful blue color indicator and is moderately friendly to landscape. 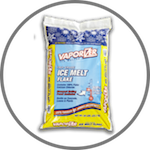 Polar Ice Melt is technologically advanced and contains Calcium Chloride, Magnesium Chloride, Potassium Chloride and Sodium Chloride. Safer Than Salt Commercial (Better): Precision formulated for commercial applications. Advanced CMA coating to jump start melting process & Magnesium Chloride coating. Available in 50 pound bags. 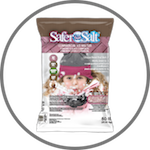 Safer Than Salt Commercial is effective to -25 degrees Fahrenheit and contains CMA, Calcium Chloride, Magnesium Chloride, Potassium Chloride and Sodium Chloride. Stealth Blue Ice Melter & Deicer (Better): Capable of melting to -30 degrees Fahrenheit. Stealth Blue Ice Melt and Deicer is highly effective active ingredients are Sodium Chloride, Calcium Chloride, Calcium Magnesium Acetate, Magnesium Chloride, and Potassium Chloride. Mr. Magic with CMA (Best): effective in melting to -25 degrees Fahrenheit, Mr. Magic with CMA (Calcium Magnesium Acetate) is available in convenient 50 pound bags and is manufactured with a helpful safety orange color indicator. 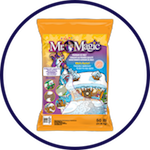 Mr. Magic packaged ice melt contains CMA, Calcium Chloride, Magnesium Chloride, Potassium Chloride and Sodium Chloride. 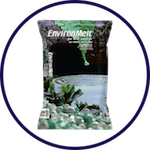 EnvironMelt Ice Melt (Best): A widely respected as THE Green Solution. Advanced formulated ice melter with CMA (Calcium Magnesium Acetate) for exceptional melting characteristics. Renown for being not as harmful to landscaping vegetation including grass, trees and shrubs. EnvironMelt is less harmful to children and pets than many competing products. Advanced engineering enables EnvironMelt to form a protective coating on the surface which provides an essential layer of corrosion protection for concrete and wood. Exceptional care taken in formulating to result in less tracking problems and residue problems when used according to manufacturer instructions. 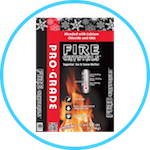 Peladow Calcium Chloride Pellets (Best): Premium performing ice melter capable of working to negative 25 degrees Fahrenheit. Available in 50 pound bags. 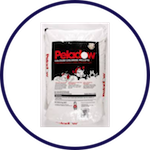 Peladow contains 92% pure Calcium Chloride pellets. Pellets effective to -25 degrees Fahrenheit. The most powerful Ice Melt product on the market, works instantly and is long lasting. This 90% calcium chloride pellet is available in 50 pound bags. Proudly made by American Rock Salt, a USA company based in Upstate NY. 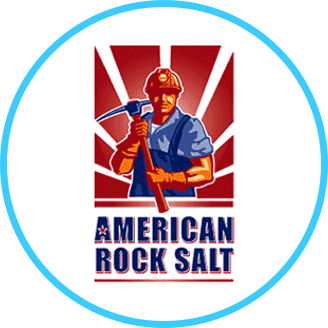 American Rock Salt (in Bulk, Bag or Pallet). Comprised of 100% natural Sodium Chloride (NaCL). Also known as Halite and Road Salt, is part of the inorganic salt chemical family. Crystalline solid is white and off-white, and has no odor. Safety note:   American Rock Salt complies with the Toxic Substance Control Act. protection, breathing protection and avoid contact with your skin. While naturally occurring, Rock Salt should NOT be ingested. To avoid caking, store Rock Salt in a dry area with less than 75% humidity. 100% mined in the USA at the American Rock Salt mine located in Hampton Corners, south of Rochester New York. Call the Rock Salt & Ice Control HQ  (a Duke Company)  at 585-292-9870  (Rochester NY) and 607-347-4455  (Ithaca NY) for more information,  business hours, and all your snow and ice removal needs and information. Text ‘DUKESALT’ to 55469 to receive text messages regarding our hours, extended hours, schedule changes and discount opportunities.